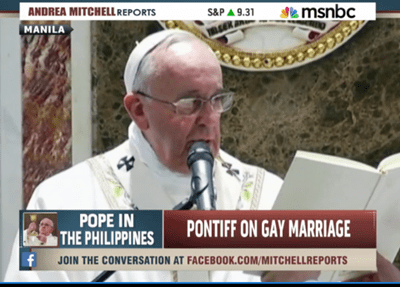 For any of you holding out hope that this was a kinder, gentler papal regime that dream is over as Pope Francis has showed his true anti-gay stripes in the Philippines on Friday. Children that could possibly have more chance of being with a loving family if gay men and women could adopt in the Philippines and be married. Wow, what a turnabout. Now he sounds like Tony Perkins…give me a break!